Our specialized high pressure washing system uses the combination of heated water and a rotating surface cleaner to deep clean the surface of the pavers without using hazardous materials. Pressure washing ensures that the surface is free of any mold, mildew, dirt and grime build up, restoring the pavers back to their original condition prior to sealing. 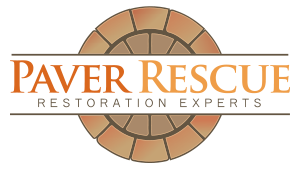 Things like tree roots, settling, water line damage and shifting can cause damage to pavers. Our trained technicians will inspect each hardscape project for any uneven, cracked, sinking or unstable areas and make the necessary repairs. Once these repairs are made, the joint sanding and sealing process can begin. The sealing process includes the application of two coats of sealant. The first coat is applied to protect from spills and stains, UV light, weather, and normal wear and tear. This also stabilizes the sand in the joints and helps prevent weeds. The second coat enhances the color of the paving stones and keeps your pavers looking like new.